In this first book of the Prodigal Daughters series, Kathleen Yoder comes home after fourteen years in the Englisher world. Practicing medicine means sacrifice - no Amish man will want a doctor for a wife. Widowed Noah Lambright offers a cottage as her new clinic, seeing how much Kathleen's skills can help their community. But as their friendship deepens, could love and family become more than a forbidden dream? 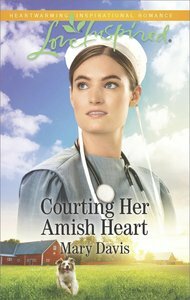 About "Courting Her Amish Heart (Love Inspired Series)"